600 years B.C. : Marseille was founded: the Greek sailor Protis fell in love with -the Ligurian princess Gyptis, they were married and founded Massalia. 49 years B.C. : Cesar laid siege to Marseille because the city was allied with Pompey. Marseille fell to the Romans and was hence known as Massilia.Vestiges of the Old Port from this period can be seen at the history museum. 416 : A monastic foundation was established by Cassian at the location of the tomb of Victor the martyr. 923 : Marseille and the St Victor Abbey were pillaged by the Saracens. 1299 : the city revolted against monastic leadership and the bishop was overthrown. 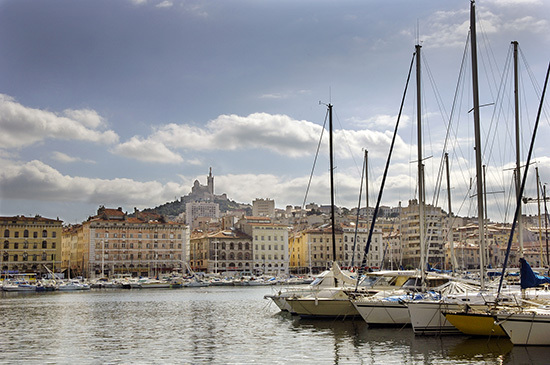 The merchants came to power and the Republic of Marseille was born. 1262 : Charles of Anjou acquired Marseille, which was incorporated into Provence, and established a naval dockyard there that was useful in his conquer of Italy. 1423 : sack of the Aragonese, the city was devastated. (the chain that blocked entrance to the port was taken as a trophy and is still displayed in the Valencia cathedral). 1481 : Marseille and Provence were annexed to the Kingdom of France. 1660 : During his stay in Marseille, Louis XIV issued orders to expand the city and build a new naval dockyard as well as 2 forts. Thanks to Colbert, the free port was established, leading to prosperity and growth of the city. 1720 : The plague strikes Marseille. Half of the population was decimated. 1792 : the Marseille battalion marched on Paris while singing "la marseillaise"
Starting in 1830, Marseille was once again a flourishing Mediterranean port. From 1848 to 1870 Marseille, "Gateway to the Orient", a new trading port was established in the growing city, monuments and churches were built, the PLM (Paris-Lyon-Mediterranean railway) arrived in Marseille, the Suez Canal was opened. 1906 and 1922 : Colonial Exhibitions at Parc Chanot (the entrance gates date to 1922). 1943 : Destruction Vieux Port neighbourhoods.1945 Destruction of the Transporter bridge. 1962 : Massive influx of settlers returning from northern Africa. The city expanded to the north. 1995 : Establishment of the Euromediterranee business district, a project of national interest. 2001 : Marseille-Paris made possible in 3 hours on the TGV train. 2013 : European Capital of Culture. 2017 : Marseille will be the European Capital of Sport.